In a time in which bad things are happening all around us and we do not know how to react or what to say, this book provides the answers. Would you love to know what to say when someone is hurting? New cutting-edge book provides all the answers you need to be less judgmental and more compassionate. After graduating from college, Laura Jack lost her mother in a tragic accident—she was hit and run over by a car while crossing the street. Laura immediately went into survival mode, taking care of everything and everyone except herself. 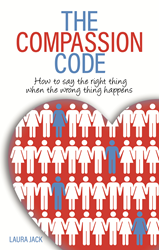 Her journey towards healing, and learning to have compassion for herself while confronting her grief, inspired her to become a Certified Grief Recovery Specialist®, and to write The Compassion Code: How to Say The Right Thing When The Wrong Thing Happens. In a time in which bad things are happening all around us and we do not know how to react or what to say, this book offers tools and resources to help readers become more compassionate with family, friend, co-workers, and themselves, particularly during life’s transitions and losses. It is available for purchase today on Amazon http://mybook.to/TheCompassionCode and will shortly be available through all retail outlets. Laura Jack teaches about compassionate communication and how we can relate to one another more effectively during the challenging moments in life. Using practices of self-care and self-love, she helps people rediscover their light after loss. Laura’s mission is to cultivate a culture of compassion, starting with self, and to create a better understanding of loss and its accompanying grief. If you want to learn more, visit http://www.laurajack.com and join the Army of Compassion https://www.facebook.com/groups/thearmyofcompassion/ to build bridges of compassion and understanding. Laura is available for interviews on radio, podcasts, local TV shows, blogs, and more. Please email her at laura(at)laurajack(dot)com to schedule an interview.